We heard a great post today on tasting fees. The sound bite is from one of our Paso Robles colleagues, Booker Winery. Enjoy! Stay tuned for more! We are just getting started. If you are interested in any of these wines, they can be purchased at our online store. Harvest 2012 has officially ended for Alma Sol. 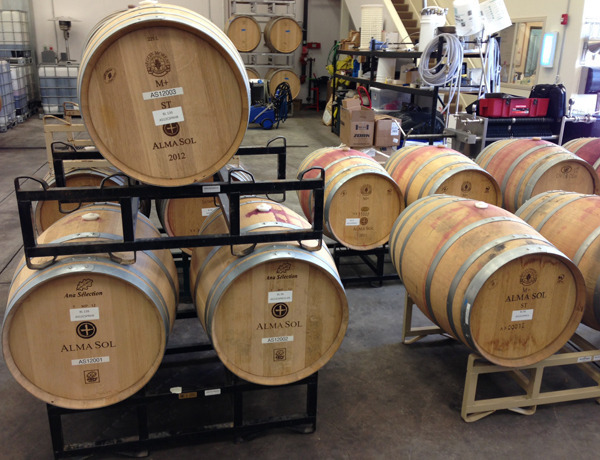 All the wines are in and most of them are already barreled down and ready to make their long journey into fine wines. We have our last lot of fruit from Halter Ranch inching through fermentation still but expect that it will be done, pressed, and put to barrel in the next few weeks. Harvest went really well and the quality of the fruit, hence the 2012 wines, looks to be absolutely spectacular. We are starting to think about post harvest now, including events, wine sales, and the holidays. We have just signed up to pour at the Ventura Winter Wine Festival and will be booking some additional pouring events locally in the coming weeks. Please watch our events page for updates and stay tuned for our newsletter which will provide a full update on harvest as well as a few specials. A few of you may have been lucky enough to try some pre-releases of our 2010 wines recently. We think that the 2010 bottlings came out pretty amazing and look forward to them getting a little bit more bottle time before we bring them back out. In the meantime, our 2009 Napa Cabernet Sauvignon is tasting pretty good. It finally has seen enough bottle aging to pull out and enjoy. We only have 20 cases of this very exciting wine left so don't wait too long - we might just drink it all before you get any! If you have "liked" us on our Facebook page you will know that it has been a busy time for Alma Sol. Harvest has officially started and we have been making trips back and forth between SoCal and Napa and Paso Robles. The Harvest is looking pretty good thus far but we still have a long way to go. Please stay tuned for more info, check our photos page, and visit us at Facebook for continued details.